Israeli forces have taken up position in southern Gaza after an overnight incursion aimed at freeing a soldier captured by Palestinian militants. In the first big incursion since the Gaza withdrawal last year, they reached the disused international airport with no reports of casualties. Israel's premier said he was prepared to take "extreme action" and suggested the incursion could last several days. Palestinian leaders condemned what Hamas called "military madness". 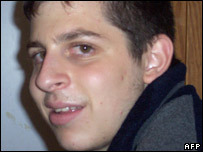 It is unclear how many troops are being used in the operation to free Cpl Gilad Shalit, launched from the Kerem Shalom crossing near southern Gaza. 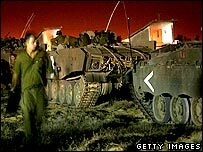 But Israeli army officials told the BBC the operation would remain "limited and surgical" and had one objective alone - to bring Cpl Shalit home safely. Cpl Shalit was taken prisoner in a raid claimed by three different organisations - including the armed wing of governing party Hamas - after a raid on an Israeli guard post near Gaza on Sunday. Israel last year pulled soldiers and thousands of settlers out of Gaza, which it had first occupied after the 1967 war. In another development, militants in the West Bank said they had abducted a Jewish settler and would kill him if Israeli continued its operations in Gaza. Israeli forces, under cover of shelling and backed by helicopter gunships, took up positions on farmland outside the disused airport about one kilometre inside the Gaza border. Three bridges linking the north and south of the strip and Gaza's main electricity transformer were bombed from the air before the incursion. "We won't hesitate to carry out extreme action to bring Gilad back to his family," Israeli Prime Minister Ehud Olmert said. "All the military activity that started overnight will continue in the coming days." He insisted Israel only wanted to rescue its soldier and did not wish to stay on in Gaza. One Israeli cabinet minister, Binyamin Ben-Eliezer, said the operation's aim was to pressurise the captors into "sending Gilad home". Palestinian families living in the path of the Israeli incursion have been fleeing their homes to find refuge in the nearby town of Rafah. Gaza residents were kept awake throughout the night by Israeli jets creating sonic booms. While the Israelis reported no resistance, Palestinian militants have been erecting barricades and preparing hideouts and ambush positions. The US has been calling on Israel to give diplomacy more time and both Egypt and France are said to have been involved in talks to free Cpl Shalit. Cpl Shalit was captured when Palestinian militants tunnelled under the Gaza border and attacked an Israeli army position at Kerem Shalom, killing two soldiers. Israel has rejected militant demands for Palestinian women and children held in Israeli jails to be freed in exchange for information about the soldier. Political leaders of Hamas have denied they know of Cpl Shalit's whereabouts and have urged his captors not to mistreat him. Hamas spokesman Ghazi Hamad said the incursion was unjustified and the crisis could be solved through "contacts with Arab and international parties". Mahmoud Abbas, leader of rival Palestinian faction Fatah and president of the Palestinian Authority, condemned the Israeli incursion as "collective punishment". But, he adds, it has been downhill all the way since Hamas - an Islamist party formally committed to Israel's destruction - was elected to power in January. Now the Israeli incursion, whatever its outcome on the ground, is bound to further poison the climate, our analyst says.